In lieu of flowers, the family suggests contributions to the El Dorado Springs Community Foundation, 309 East Hospital Road, El Dorado Springs, MO 64744. 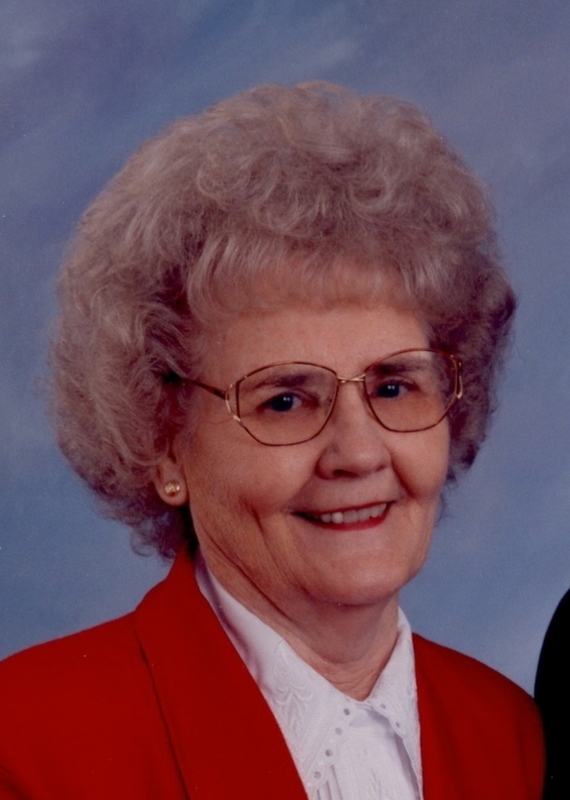 Ethel Emma (Wolf) Shellhorn, age 81, passed away on April 17, 2012, at the Cedar County Memorial Hospital in El Dorado Springs, Mo. She was born to Fred and Alta (Richardson) Wolf near Jerico Springs, Mo., on June 8, 1930. Ethel attended grade school at Cedar Hall near Jerico Springs and graduated from Stockton High School in 1947. After graduation, she attended Missouri State Teachers College (now Missouri State University) in Springfield and taught at Cedarville, Barnes, and Green Ridge, one-room schoolhouses in Cedar County, Mo. Ethel and Edsel "Chig" Shellhorn were married on March 5, 1949, near Greenfield, Mo. To this union were born three children: Marilyn, Saundra, and Larry. Following the birth of her children, Ethel became a homemaker and devoted herself to her family and life on the farm. She tended large gardens, canning and freezing produce for her family; harvested countless chickens; sewed numerous garments for her daughters; and even worked alongside her family storing hay in the barn at times. After her children were grown, Ethel and Edsel moved to El Dorado Springs, where Ethel worked part time at the Clothes Closet and Hacker's Jewelry. Ethel was saved and baptized as a teenager and was a member of Fairview Community Church, Osiris, Mo., at the time of her death. After she and Edsel moved to El Dorado Springs, they enjoyed attending Union Hall Baptist Church as long as her health allowed. Ethel was a member of the Order of the Eastern Star in Jerico Springs. Ethel was preceded in death by her parents, an infant brother, and a half-brother and his wife, Clarence and Dixie Wolf. She is survived by her husband of 63 years, Edsel, of the home; their children: Marilyn (Denny) Dennis, Springfield, Mo., Saundra Bobbett, Lee's Summit, Mo., and Larry (Kathy) Shellhorn, Stockton, Mo. ; four grandchildren: Scott (Jayme) Shellhorn, Buffalo, Mo., Emily (Sam) Mathews, Ozark, Mo., Katie (Jared) Green, Ozark, Mo., and Aaron Dennis, Springfield, Mo. ; three great-grandchildren: Blake Shellhorn and Rylee Shellhorn, Buffalo, Mo., and Scotty Mathews, Ozark, Mo. ; her brother and sister-in-law, Lewis and Helen Wolf, Jerico Springs, Mo. ; sister-in-law, Gladys Schmitt, Bethany, Mo. ; many nieces, nephews, great-nieces, great-nephews, and a host of lifelong friends. Ethel’s family meant everything to her. She delighted in each and every accomplishment of her children, grandchildren, and great-grandchildren and was their biggest supporter. Words cannot describe how much she was loved, how thankful we are for her life, and how much she will be missed. Funeral services are scheduled at 10 a.m. on Saturday, April 21, 2012, at Bland-Hackleman Funeral Home, El Dorado Springs, with the Rev. Jesse McCallister officiating. Burial will follow in the El Dorado Springs City Cemetery under the direction of Bland-Hackleman Funeral Home. Pallbearers are: Albert Shellhorn, Scott Shellhorn, Sam Mathews, Jared Green, Aaron Dennis and Denny Dennis.